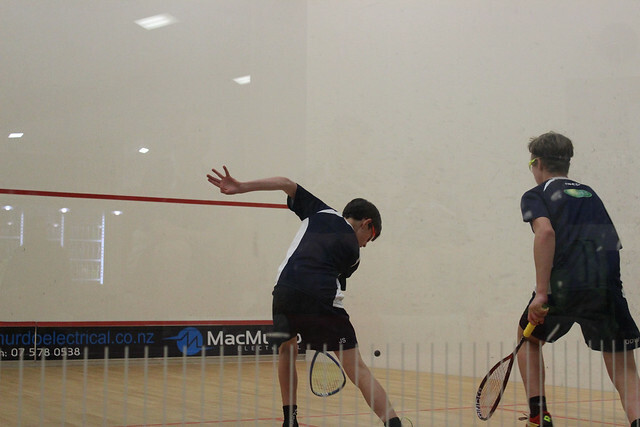 It was an exciting day at the Devoy Squash and Fitness Centre with teams travelling from as far as Taupo to take out the Div 1 Team Championship title. The Girls draw proved to be a nail biter with Trident High School pulling out a blinder of an upset, winning in a down to the wire count back over Tauranga Girls College and John Paul College. The Boys draw showed Tauranga Boys College as a dominant force as both the TBC Blue and Red teams faced off in the final showdown. With a 1-1 draw and one game to go, the deciding match had the boys leaving it all out there for the win. It was an awesome day with high quality matches and impressive sportsmanship all round. Thanks to Mike (TD) and Devoy Squash and Fitness for running a brilliant event.